Here is my selection of the many summer beer gardens in Tokyo. 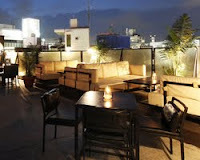 Most of them are located on the roofs of buildings and have nomihodai (all-you-can-drink) deals. Barbecue and beer on a department store roof. Until? The end of September. All-you-can-drink? 2 hours 3600yen with barbeque chicken. What drinks? Kirin draft, black, half & half, Heineken, wine, sours, sake, shochu, highballs etc. Address? Lumine East dept. store rooftop, 3-38-1 Shinjuku, Shinjuku-ku, Tokyo. Pretty good deal in a fancy spot. Two beers have been specially brewed for this beer garden. All-you-can-drink? 2800yen unlimited microbrews and chef’s appetizer plate. What drinks? Kanagawa's Sankt Gallen Park Brewery Ale and Amatsu Ale. Times? Weekdays 6:00-8:00, Weekends/hols and Aug 8-12 5:00-7:00. Posh beer garden at the Hilton. All-you-can-drink? 2 hours 7500yen with assorted Chinese food, cold meat, cheese, shaved ice. Address? 7F Private Lounge, Hilton Hotel Tokyo, Shinjuku. Standard department store rooftop beer garden. All-you-can-drink? September 10th to 17th 90 mins 2500yen. For over 8 people 3800yen 90mins with 6 kinds of food. A la carte? Asahi 600yen, pitcher 2000yen, sours etc 450yen. Loads of small Asian restaurants together on the (undercover) roof of this Kabukicho building. Some of them have all-you-can-drink deals. All-you-can-drink? 2.5 hours (Sun to Thur), 2 hours (Fri, Sat, Hols) with 10 food items from 2950yen. A la carte? World beer, drinks, Thai and Vietnamese food available. Times? Mon-Sat 5:00pm-5:00am, Sun/hols 4:00-midnight. All-you-can-drink? 2.5 hours with 8 food items from 2980yen. A la carte? World beer, drinks, Asian food. Times? Mon-Thu 5:00pm-2:00am, Fri/Sat 5:00pm-5:00am, Sun/Hol 5:00pm-midnight. What drinks? Beer, wine, shochu, whiskey, soft drinks. Department store rooftop beer terrace. A la carte? Beer from 630yen. Drinks and food. Address? Tokyu Toyoko dept. store south building roof, 2-24-1 Shibuya, Shibuya-ku, Tokyo. Department store rooftop beer garden. A la carte? Kirin Ichiban 435ml 500yen, 800ml 950yen, 1800ml 2000yen, other drinks from 500yen. Address? Tokyu dept. store Shibuya Honten rooftop. All-you-can-drink? 4500yen with all-you-can-eat barbecue. This organic cafe has a small outdoor area. All-you-can-drink? 100 mins with 5 food items 4200yen. What drinks? Heartland beer, organic wine, umeshu, cocktails, softdrinks. Save 1000yen by starting at 5:30. All-you-can-drink? 2 hours 5000yen with food course, 4000yen if start before 6pm. What drinks? Premium Malts beer, cocktails, wine, shochu, sake, umeshu, soft drinks. A la carte? Beer from 780yen. This Vietnamese restaurant has an outdoor terrace. This Chinese restaurant has an outdoor terrace. What drinks? Beer, shochu, shaoxing wine, whiskey, highball, red wine, sours, cocktails, soft drinks. Wooden terrace with a variety of food and drink courses. All-you-can-drink? 2 hours with food course from 3800yen. A la carte? Tapas 500yen. Beer terrace with motsuyaki and yakitori. All-you-can-drink? With 8 food items 4000yen. A la carte? Beer from 600yen. Grilled meat. Big outdoor beer and barbecue area. With trees! All-you-can-drink? 2 hours with all-you-can-eat barbeque. Men 4000yen, women 3800yen. What drinks? Kirin Ichiban, Kirin stout, Budweiser, sours, highballs, wine, cocktails. All-you-can-drink? With food sets from 3900yen. The cheaper option at the Prince Hotel. All-you-can-drink? 90 minute sets with food from 2500yen. What drinks? Beer, shochu, highball, orange juice, oolong tea. Nice beer garden in Shinagawa. All-you-can-drink? From 4000yen with 5 food items. What drinks? Suntory Malts, Malts black, half and half, sours, wine, soft drinks. A la carte? Beer from 750yen, food from 550yen. Beer garden near the Prince Hotel. All-you-can-drink? With 8 food items from 3800yen (women), 4300yen (men). A la carte? Beer, highballs etc from 650yen. Italian-style food. Classic department store rooftop beer garden. All-you-can-drink? 2 hours with all-you-can-eat barbeque lamb 4500yen. Times? Weekdays, Saturdays 4:00-10:00, Sundays 4:00-9:00. Nice Ginza views on top of this building. All-you-can-drink? 2 hours with all-you-can-eat barbeque lamb and food bar 4500yen. A la carte? Asahi Super Dry regular 500yen, mega size 950yen. Also Bass Pale Ale, Hoegaarden, cocktails, wine, highballs, etc. Famous Tokyo department store beer garden. All-you-can-drink? 2 hours with all-you-can-eat men 3601yen, women 3001yen. Actually a garden in a park. Stations? Hibiya, Yurakucho, Kasumigaseki, Ginza. All-you-can-drink? Group party courses for 2 hours with food 5250yen. A la carte? Various kinds of beer, drinks and food. Salaryman central, with Budwesier girl waitresses. All-you-can-drink? 2 hours 1365yen (for over 4 people). A la carte? Budweiser from 635yen. Nice garden area at Tokyo Dome Hotel. A bit of a fancy beer garden. Pretty cheap deal at this Hawaiian themed beer garden. A la carte? Drinks from 500yen. Decent buffet at this summery beer garden. All-you-can-drink? 2 hours 3980yen with all-you-can-eat Chinese, Japanese and Western buffet. What drinks? Beer, sours, wine, shochu, soft drinks. All-you-can-drink? 2hours 3900yen with all-you-can-eat. What drinks? Beer, wine, whisky, shochu, cocktails, soft drinks. All Yebisu here if you're sick of all the Super Dry elsewhere. All-you-can-drink? 2 hours with 1 food item 2500yen. What drinks? Yebisu draft, scotch highball, sours, orange juice, oolong tea. Times? Weekdays 5:00-11:00. Closed weekends, holidays. Hotel roof beer garden with 500yen food and drinks. All-you-can-drink? 90 mins with food course from 4000yen. Nice bay views here in a Hawaiian themed restaurant. All-you-can-drink? 2 hours with food platter from 4000yen (for 4 or more people). Not cheap, but nice green hotel beer garden. All-you-can-drink? 2 hours with various barbeque sets from 6500yen. A la carte? Beer 800yen. Drink and food available. What drinks? Kirin Ichiban, whiskey, sours, wine, sake, soft drinks. Times? July, August 5:00-9:30, September 5:30-9:30. Good nomihodai deal with views of Ueno park. What drinks? Draft beer, sours, summer cocktails, soft drinks. Classic department store beer garden with hotpot cuisine. All-you-can-drink? 2 hours with nabe 3300yen. Have some cocktails by the pool and pretend you're on holiday. A la carte? Beer from 900yen. Hawaiian/American food from 800yen. Beer and buffet overlooking a park. All-you-can-drink? 2 hours with food buffet 4500yen. What drinks? Asahi Super Dry Extra Cold, soft drinks. Times? 5:00-10:00. Closed 7/19, 8/8-8/19, 8/30. Nice garden here with a decent deal for groups. Did you expect a beer garden at the Sheraton to be cheap? All-you-can-drink? 2 hours with BBQ 8200yen. 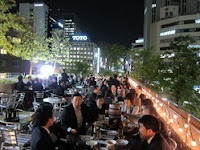 This izakaya right in front of Kameido station has an rooftop beer garden area. All-you-can-drink? No, but cheap drinks and food. A la carte? Cheap yakitori (from 80yen), motsu, izakaya food. Beer from 430yen. Garden furniture and lanterns by the river. All-you-can-drink? With food 3600yen men, 3100yen women. Bit of a terrace here on this hotel. A la carte? Beer from 700yen, BBQ lamb sets from 1300yen. All-you-can-drink? 2 hours with all-you-can-eat 3980yen. After climbing Mount Takao, have some beers at the top. Address? Mt. Takao Observatory. From Takao-san-guchi station, take the cable car up the mountain to Kiyotaki station. Not actually a beer garden, but a fun booze cruise. Stations? Takeshiba passenger terminal. Closest stations are Takeshiba, Hamamatsucho or Daimon. All-you-can-drink? With cruise & entertainment 2500yen. Food available separately. What drinks? Beer, wines, sours, juice. Times? The boat leaves at 7:15 and 9:00 every night. Gotta say - this is really useful. Thanks.